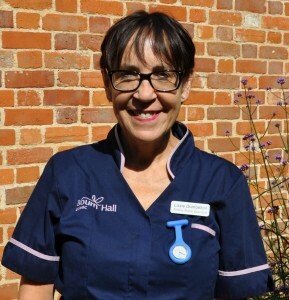 In good remission from leukaemia, Fertility Nurse Specialist Lizzie continues to enjoy helping Bourn Hall patients throughout their fertility treatment. Lizzie’s role involves booking patients’ treatments, and providing information and advice including a drug teach to help patients with self-administration of injections. However Lizzie’s world changed when she was diagnosed with leukaemia in 2011. Initially she felt able to continue her job with support from her colleagues but in January 2013 required treatment. “I remember telling management that I would need chemo,” says Lizzie. “They were very supportive and many of the nurses came to visit me in hospital. To assist Lizzie’s return to work, a new post was created which is more suitable to her needs and ensures that her skills, experience and compassion are used to greatest effect within the clinic. She says: “What I like most about my new role is the patient contact; helping arrange their initial appointments, checking consent forms and arranging treatments. Update: Lizzie has recently taken a well deserved retirement we wish her every happiness.